Divers Alert Network (DAN) - Dive safety organization affiliated with Duke University Medical Center in Durham, NC, and supported by the largest membership association of divers in the world. 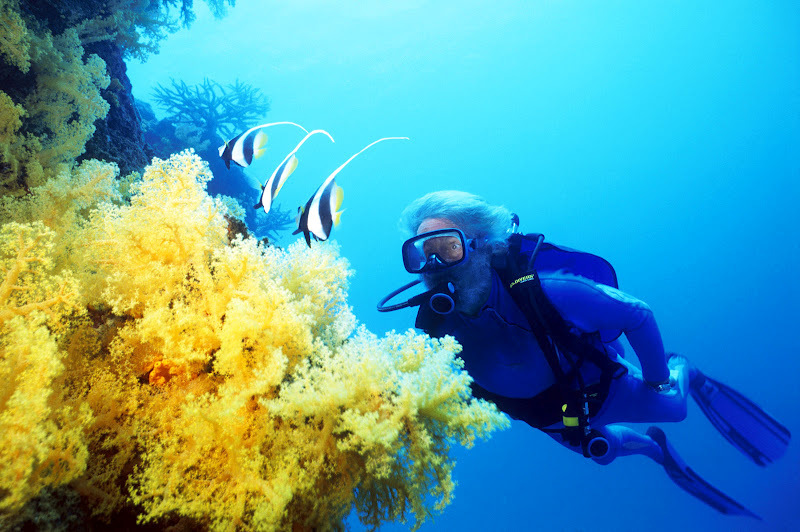 Diving Medicine Online - Information on illnesses related to the undersea environment. Doc's Diving Medicine Home Page - Dedicated to undersea medicine and to issues of diving safety for both sport and professional divers. International Association of Nitrox and Technical Divers (IANTD) - World's largest scuba diving training organization of openwater, nitrox, enriched air, overhead environment, cave, wreck, rebreather, trimix, gas blenders, technical scuba divers, instructors and instructor trainers. Undersea and Hyperbaric Medical Society (UHMS) - Information for diving and hyperbaric medicine physiology. Association of Diving Contractors International (ACDI) - Created to promote commercial diving, establish uniform safe standards for commercial divers, and encourage industry-wide observance of these standards. Cyber Diver News Network (CDNN) - Scuba diving news. Dive Rescue International - Training and equipment for public safety professionals. Diving Bell - A rigid chamber used to transport divers from the surface to depth in open water, usually for the purpose of performing underwater work. Also see The Atlantic article by Bryce Emley: How the Diving Bell Opened the Ocean's Depths. Force Fin - Diving fins sports equipment. Light and Motion - The home of underwater imaging innovation and online link to the technologically advanced and innovative underwater video and still photography equipment. National Association of Underwater Instructors (NAUI) - NAUI trains, qualifies, and certifies leaders and instructors, establishes minimum standards for various levels of diver training, and provides various programs, products, and support materials to assist NAUI leaders and instructors with their diving supervising and teaching. NOAA Diving Manual - Written for use by NOAA scientists/divers to assist them in conducting various operations. Noted to be the largest seller in the Government Printing Office, the manual is a comprehensive reference specifically designed for the diving professional. The manual is used by government agencies and commercial groups. The diversity of the manual ranges from polluted water diving procedures to saturation and underwater habitat diving. The NOAA Diving Manual contains USN Air Decompression Tables as well as USN, Royal Navy, and COMEX Recompression Treatment Tables. NOAA Diving Program (NDC) - The NDP is administered by the U.S. Department of Commerce, National Oceanic and Atmospheric Administration (NOAA), and is headquartered at the NOAA Diving Center in Seattle, Washington. The NDP trains and certifies scientists, engineers and technicians to perform the variety of tasks carried out underwater to support NOAA's mission. With more than 400 divers, NOAA has the largest complement of divers of any civilian federal agency. In addition, NOAA's reputation as a leader in diving and safety training has led to frequent requests from other governmental agencies to participate in NOAA diver training courses. Nordic Underwater Archaeology - In underwater or maritime archaeology you learn about the past from maritime finds, usually shipwrecks, but also dwellings and ports. At this site, learn about maritime archaeology worldwide, from a north European perspective. Professional Association of Diving Instructors (PADI) - World's largest recreational diving membership organization. The membership includes dive businesses, resort facilities, academic institutions, instructor trainers, dive educators, divers, snorkelers and other watersports enthusiasts. SanDiegoDiving - Promoting education about and conservation of the marine environment through diving. Includes scuba diving-related articles, information on dive sites, and links to hundreds of related websites. ScubaLink - Scuba diving directory and search engine. Sub-Aqua Association - News, information, entertainment about all aspects of the scuba diving industry. U.S. Navy Diving Manual - Complete resource, fully indexed. Underwater Archaeology - Underwater diving history, techniques, research, exploration. This webpage last updated on Monday, July 17, 2017 1:26 PM.